Sorghum (Sorghum bicolor) belongs to the Poaceae family and is one of the most important cereal crops in the world. The grain is mainly consumed in the form of flat bread or porridge. Sorghum is extremely drought tolerant, making it an excellent choice for semi-arid and dry areas. 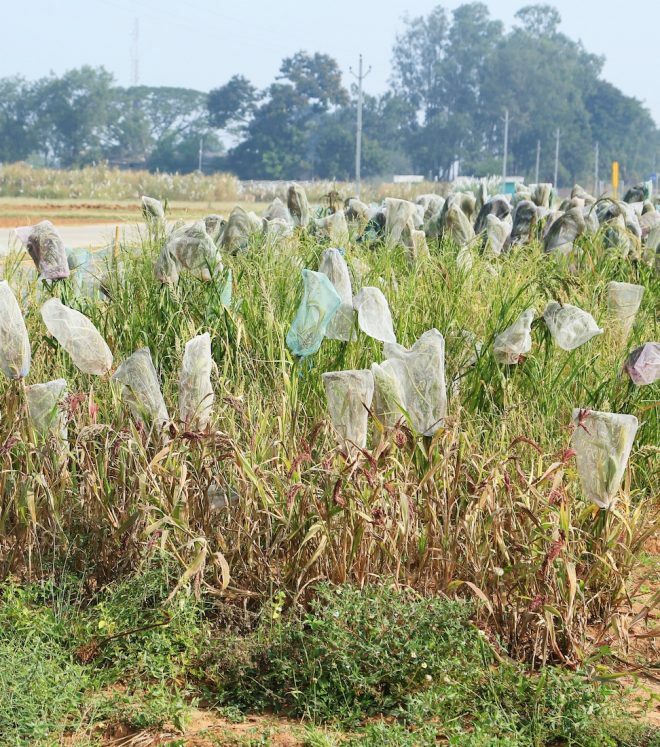 Regeneration and characterization of Sorghum at ICRISAT. There are about 30 species of sorghum; S. bicolor is cultivated for grain and forage while S. halepense (Johnson grass) and S. propinquum are cultivated only for forage. Sweet varieties of S. bicolor contain a high concentration of sugar in the stalks and are grown to produce sorghum syrup, forage and silage. Although it is mostly self-pollinating, protogyny may cause at least 5% natural cross-pollination. The genetic integrity of sorghum accessions is thus maintained by ensuring that flowers self pollinate. One of the largest collections of sorghum is at the International Crop Research Institute for the Semi-Arid Tropics (ICRISAT) in India. The USDA holds large collections of sorghum at the Southern Regional Plant Introduction Station, University of Georgia, and the National Seed Storage Laboratory, Colorado.